Where did strawberries originate--learn about strawberry origins here. Indigenous species of strawberries have been found in most of the world's arable landmasses, with notable exceptions including Australia; South America east of the Andes Mountains; the Middle East; and Africa (the Fragraria vesca strawberry species has been grown in the Middle East and northern Africa for a very long time and may also be native to those areas). 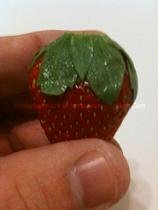 However, the "garden" varieties of strawberries with which most of us are familiar today are known as Fragaria ananassa. "Ananassa" is Latin for "ananas-like"; Ananas comosus is the botanical name for the pineapple plant; and the strawberry plant was so named because of the supposed resemblance of the "berry" to a pineapple plant in shape, smell and taste. The F. ananassa hybrid is a cross between Fragaria chiloensis (the "Chilean strawberry") and Fragaria virginiana (the "Virginian strawberry"). The "Chilean strawberry" (or a group of very similar subspecies) is actually native to coastlines in both North and South America, and the Hawaiian islands. Likewise, the "Virginian strawberry" is actually indigenous to much of eastern North America. In fact, the range of subspecies F. virginiana ssp. glauca lies tantalizingly close to that of F. chiloensis. Nevertheless, the first cultivated crossings of F. virginiana x F. chiloensis occurred in Europe sometime within the roughly half century span from 1714 to 1766. Although the exact year is unknown (the crossings were completely accidental), it certainly occurred after 1714. That was the year in which the first specimens of F. chiloensis arrived in France, brought there by Lt. Col. Amédée François Frézier from Chile at the end of his voyage (hence the name "Chilean strawberry"). Similarly, the crossing of the two species must have preceded 1766, the year that Duchesne's L'Histoire Naturelle des Fraisiers (English, The Natural History of Strawberries) was published. In this book, Duchesne first recognized the F. ananassa plants for the F. chiloensis x F. virginiana hybrid that they were. Among those that received a living F. chiloensis plant from Frézier was the Royal Medicinal Garden in Paris, France. Consequently, it has long been speculated that the first F. ananassa strawberries may have grown in this royal garden. Whether this is correct or not, it is certain that the first "garden" strawberry cultivars did sprout somewhere in the southern England-northern France-Benelux region of western Europe. As an interesting aside, the name "Frézier" is etymologically derived from "fraise", the French word for "strawberry". However, the name "Frézier" pre-dates Lt. Col. Frézier and his mission to Chile. It is just another odd case of someone "living-up-to-his-name".